So, which is better – traditional publishing or self-publishing? Can you make any money at either? Let’s ask a man who knows. This week the shelf of Books Written by People Who Live in My House was added to by one, as JH’s The KLF: Chaos, Magic and the Band who Burned a Million Pounds was published by Orion. But hang on, didn’t that book already come out? And not from one of the UK’s biggest publishers? 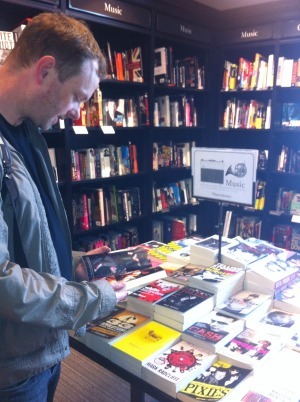 “On Thursday my book about The KLF was released, so I undertook the traditional author publication day pilgrimage and went down to Waterstones to look at it sitting on a shelf. This is one of the great joys of being traditionally published. I enjoy it more than most, I think, because I’m an author who publishes both independently and traditionally, and hence I’ve only been able to do it for 50% of my books. Much has been written on writers’ blogs about the traditional vs indie divide, but I’ve found that to be a false dichotomy. The KLF is now traditionally published, but it only exists because of indie publishing. An author shouldn’t define themselves through one or the other, but just be grateful that both exist. Authors are not the masters of the books they create. They are the victims. Book ideas prey on writers like lions padding toward a herd of plump, lazy gazelles, and once one has grabbed you, you’re stuffed. You have no choice but to write it. At best you can put it in a queue and tell it to wait its turn, but ultimately the only way you can get out of finishing the damn thing is to prevaricate until either you or it dies. Given that you have no choice about the books you write, the only question then becomes whether that book should be an indie or traditional title. The KLF had to be written as an indie book. Much of what is interesting about the story is how the one-time biggest selling singles band in the world effectively disappeared, to the extent that almost no-one under the age of 35 has heard of them. That’s great for the story, but not so good for the traditional business model. It makes the book look niche, which pushed it into indie territory. This was as much a financial decision as anything. After agent fees and various publisher accounting voodoo, I make an average of about 60p per copy for my first book. But putting KLF out on Kindle for a nice cheap £4:30 still netted me £3 per copy, meaning it could sell a fifth less and make the same money. If it had been written for a publisher I would have written a more typical music biography. As I was essentially answering to myself, I was able to write exactly the book I thought it should be. If you’re familiar with The KLF, you’ll know that only a very strange book could capture their spirit. If you’re not familiar with their story, just know that the book starts with them burning a million quid and goes psychologically downhill from there. When the book was written, I was able to cast it out into the ebook world and see if it would sink or swim. From that point on, all that mattered was how strong the book was. As it turned out, it was a healthy little thing which quickly started attracting word-of-mouth, and sales. Traditional publishers are not daft, and they increasingly use the Darwinian struggle of the indie world as their slush pile. If a book sells and is talked about, then you will find them very friendly. I’ll tell you what, @johnhiggs‘ book about the KLF is – like its subject – a thing of endlessly fascinating, utterly demented genius. It seemed the book was not as niche as it first appeared. It sold over 1,000 copies in 10 weeks and UK paperback rights were bought by Orion. More importantly, I was able to meet exactly the right editor for my next book. This is a massively ambitious alternative history of the twentieth century, and it absolutely has to be traditionally published. 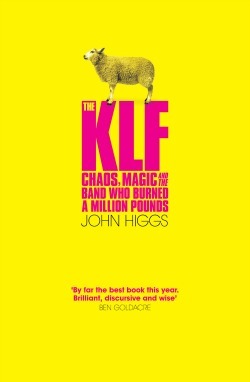 The KLF: Chaos, Magic and the Band who Burned a Million Pounds by John Higgs is out now. The first edition has a sticker of a sheep on the front, for reasons we don’t quite understand but quite like anyway.